For a small, tough, lifted, off road capable Jeep trailer — use these Off Road Trailer Plans. This one is tough, with lots of ground clearance for carrying your gear on those out and yonder adventures. Several design options allow you to customize the trailer. Then, feel free to make your own enhancements to make it perfect for your travels!! 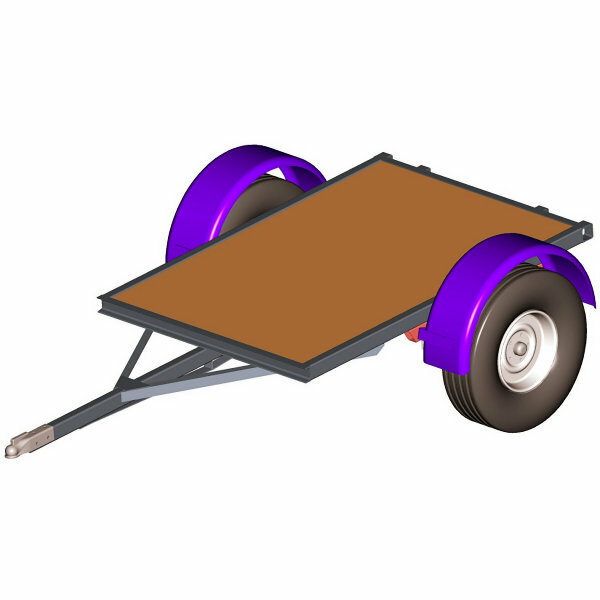 If you need something a touch stouter, and with a torsion axle, check out our Off Road 4′ x 6.5′ 2500# Trailer Plans. Single axle, leaf spring design. High clearance “lifted” options. 4′ x 6′ nominal bed size. (Actual bed is slightly bigger.) And, we know one size does not fit all, so customize it! You can modify the bed length or width a little if you want. Just follow these guidelines. Options in the plans for sides and/or a top. Optional removable ramp plans also included. Plans come with complete drawings and instructions. Plans include lists of components and materials along with possible sources to get the parts you need. By your request . . . Here are the plans for a smallish, high clearance off road trailer designed to hitch to your 4×4 and head to the hills. A Jeep Trailer? Yes. And an anyone, everywhere 4×4 trailer. Just right to pack a few extra things to make the trip a little more comfortable — and stylish. Customize the look to be just exactly what you want. Customize the function to haul just what you need. This is the launch pad. Plans include detail drawings, illustrated instructions, and several options for versatility — including the sides and opening top options shown in the image. Use your imagination and attach the accessories you need — like fuel tanks, shovels, jacks, etc.. Install a fold out top tent for camping off the ground too, if you want. The trailer is designed tough to handle your adventures. Throw in your gear and go. Trailer bed size is slightly larger than 4 ft. wide x 6 ft. long. Trailer bed height as shown is 26.5″. Actual height will depend on options chosen. Can be lifted higher to match your 4×4 if desired. Also bigger tires are certainly an option — for looks and for function. Ground clearance as shown is 14″ (axle) and 18″ (central). Actual clearance will depend on options, like tire size. Trailer weight will vary depending on design options, but will range from 400 lbs (minimal flat bed w/o deck) on up.